Hi Everyone!!! Tonight is a special night for our son! Tonight is Awana Award Night! Awana is a church group for those of you who are not familiar with it. The program is for ages 2 through 6th Grade. I know what a span right. It is a wonderful program. I have seen our son change in so many ways. I am so proud of him and I'm grateful to our church for having this program for our children. Our son is a little further in the program now. His area that he is in is called Truth & Training. T&T engages third- through sixth-graders by answering their questions about God and the Bible, guiding them through this pivotal life stage to grow in Christ's grace. I decided to surprise him with a card of his own. A special card. 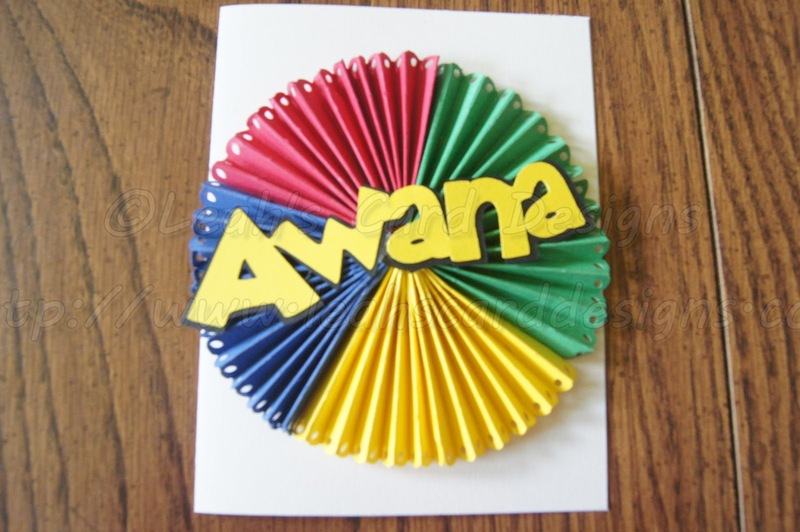 I used the colors of Awana for the Rosette. I then used two different fonts to make up the word Awana in the way it shows on their books. I can say our son was pleasantly surprised. Here is the card I made him. Thanks for stopping by! !